Always wanted an unconventional venue to celebrate your big day? 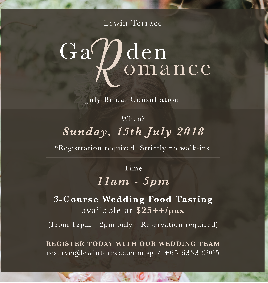 Come on down to meet with our team of experienced in-house wedding planners to find out more about our customizable wedding/ solemnization packages! New inquiring couples can opt to try our special 3-course wedding tasting menu at $25++/pax! Reservations required for the tasting session (Between 12pm-2pm only).